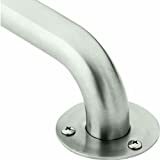 Exposed screw stainless steel grab bars are available in 18'', 24'', 36'', and 42'' lengths. These grab bars meet The American Disabilites Act (ADA) specifications and have been tested to withstand a 300 lb. pull when securely installed per instructions.